I intended to publish the first post on my recently-refreshed website much sooner than today. The delay is due to being caught up in a surge of media interest over a Harry Potter themed species description that formed part of my masters research. 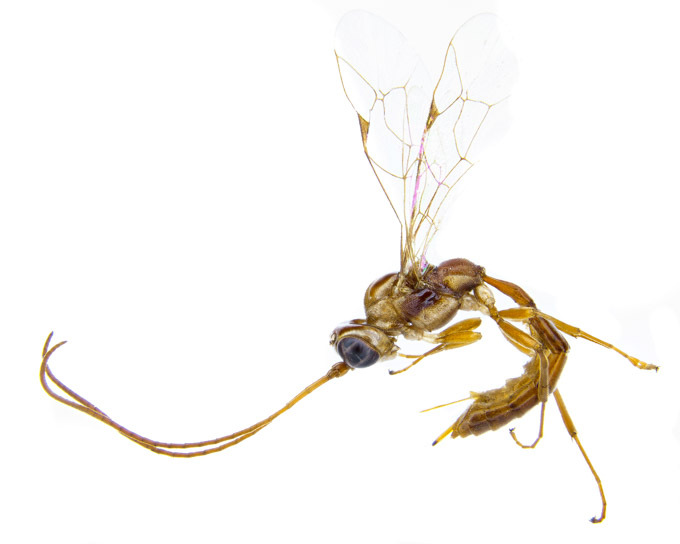 A new species of Lusius (Hymenoptera: Ichneumonidae) from New Zealand. 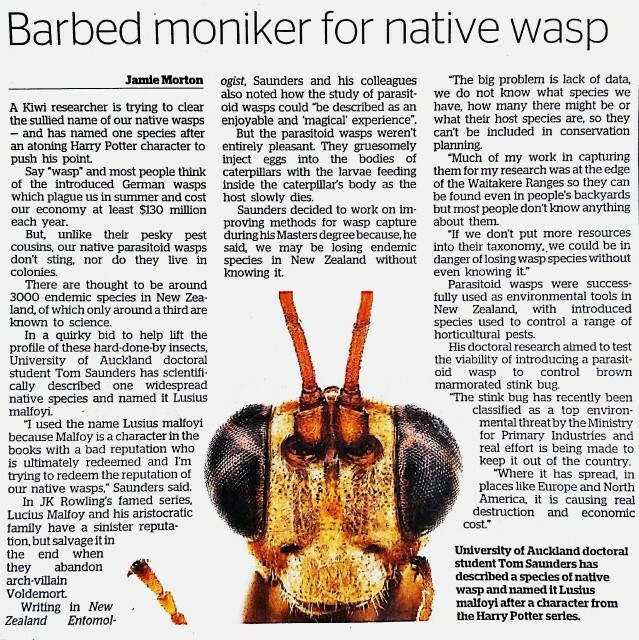 I was lucky enough to have the honor of describing and naming a native species of parasitoid wasp new to New Zealand. This species was recognized as new by the late Ian D. Gauld during his time in New Zealand. Ian remains a highly respected entomologist whose passion and meticulous work ethic has inspired many of the hymenopterists working today. My masters supervisor, Dr Darren Ward from Landcare Research, trained me in the methods of species description and assisted me greatly during the process. The genus name for this species was already known to be ‘Lusius’ from Ian’s previosu work. I decided to name the species after the character Lucius Malfoy from the Harry Potter series. The main reason was to parallel the way in which Lucius Malfoy, and wasps in general, are both considered to be villains. However, just as Lucius Malfoy is pardoned near the end of the Harry Potter series, I wanted people to pardon wasps in their own minds too. This is because wasps are so misunderstood! 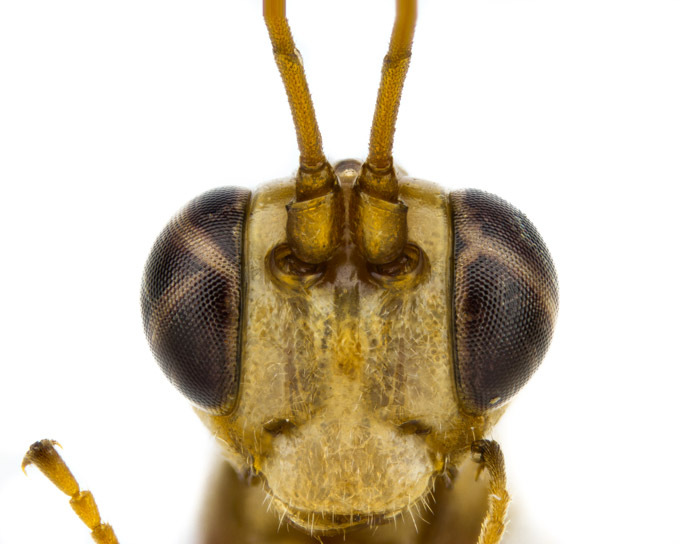 The vast majority of wasp species are either neutral or beneficial from a human perspective. Only a few species are pests that sting people and cause dread. In fact, none of New Zealand’s native wasps are like this at all, only a handful of introduced species spoil their reputation here. In order to get the word out I contacted Anne Beston from the University of Auckland Media Relations team. She poured her time and energies into helping me craft the perfect media release. She then sent this to Jamie Morton, the science reporter at the NZ Herald. He wrote a fantastic story around the release, combining extra detail with the flair of an accomplished storyteller. His story was so well written that it piqued the interest of The Guardian, who interviewed me over the phone and ran the first international story on my fight for wasp-acceptance. From there the story exploded – It was picked up by news agencies in the United States, Latin America, Asia, and Europe. Story in the print edition of NZ Herald. The most surreal moment: Speaking to CNN on the phone while answering emails from India!